The Internet is abuzz with people wanting to learn to play the fiddle. My guess is that you are one of them! Of course, you want to learn the easiest songs possible. Who wouldn’t? The songs that are the easiest to play are the tunes you already know. They’re the ones you’ve had in your head for years. So instead of having me teach you a totally unfamiliar tune on the fiddle, let’s get you to learn how to play the tunes you already know. I suggest you start making lists of your favorite songs. If you write them down on the computer, you can move them around into various sub-lists by cutting and pasting. As you’re looking over your list of favorites, you’ll want to think how the melodies go. As you sing them in your head, notice that melody notes either go up or down, or stay the same. I would divide your list into easy songs and not-so-easy songs. The easy songs tend to be the ones you know the best. They’re also short. The shorter the melody, the easier they are to learn. Keep in mind that some melodies are very notey. (Celtic tunes are all that way). These kind of tunes will be more difficult to learn. On the other hand, some tunes use only a few notes, and these notes are repeated several times throughout the tune. There’s several reasons why “Skip to My Lou” is relatively easy to play. 1) It’s extremely well known. 2) it’s short (just four lines), 3) the melody of lines one and three are identical 4) the melody of line two has the same rhythm feel as lines one and three. 5) starting with the word “to” on line four, this line is nothing more than a descending scale. Let’s figure out how to play “Skip to My Lou,” on the fiddle. Start by playing a G scale on the fiddle starting on the D string with your ring finger. You’ll also need to know that a G chord consists of just three notes: G, B and D. Any song you can think of can start with one of those notes. Play those three notes and try to sing “Skip to My Lou.” Did you find the first note for the word Lou? (Hint: it’s a B with your index finger), the second note (“lou”) is a G on the D string with your ring finger. The third note (“skip to my”) is a B. The last note of line one (“lou”) is a D on the A string with your ring finger. Now you’ve got line one. If you don’t know the names of your notes and where to find them on your fiddle, you need to back up and learn the basics on the fiddle . 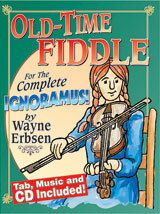 To get this vital information, and more, I would honestly suggest you purchase my recent book and CD set, Old-Time Fiddle for the Complete Ignoramus. It has tons of easy tunes, is fully illustrated, and the friendly and easy instructions will keep you from developing BAD HABITS that will be difficult to break. It will send you down the road of happy fiddle playing. Why don’t you give it a try? If you don’t learn anything of value from it, return it, and I’ll give you a total refund. How’s that? By the way, this book is the best-selling fiddle book in America.